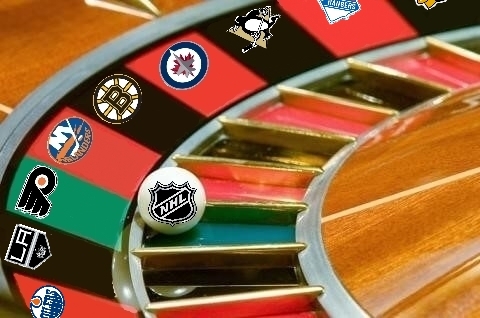 Welcome to "Roster Roulette," a series where the Pens Initiative crew gives their opinions on the Las Vegas Golden Knight's expansion draft. Feel free to voice your own drafts and thoughts in either the comments section below or via Twitter! 1) Vegas must select one player from each presently existing club for a total of 30 players (not including additional players who may be acquired as the result of violations of the Expansion Draft rules). 2) Vegas must select the following number of players at each position: 14 forwards, nine defensemen and three goaltenders. 3) Vegas must select a minimum of 20 players who are under contract for the 2017-18 season. 4) Vegas must select players with an aggregate Expansion Draft value that is between 60-100% of the prior season's upper limit for the salary cap. From TSN in Canada: "Assemble the Knights!" 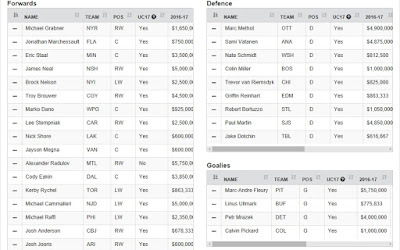 From CapFriendly.com: "Expansion Draft Tool"
1) While the Las Vegas Golden Knights are allowed to make deals with every NHL team to NOT draft a given player from a roster (thus rendering some of the "available" players off-limits), these deals will not be announced until AFTER Las Vegas announces its roster, so for our purposes, all available players will be available to us. 2) Pay attention to whether or not players are under contract for 2017-2018 or beyond. Las Vegas is allowed to draft players that will be Unrestricted Free Agents in July, but should that player NOT sign, the Golden Knights will have effectively wasted a draft pick, so be mindful of that when creating your own roster! My strategy in drafting for the Las Vegas Golden Knights was simple: emulate the Penguins' success by drafting down the middle (strong centers for each line), draft for speed when available, and draft as many players under contract and under 30 as possible. I allowed myself a Hail Mary toss on one particular UFA, but not at the expense of creating a team with both depth, scoring, and the all-important and always-mocked GRIT. 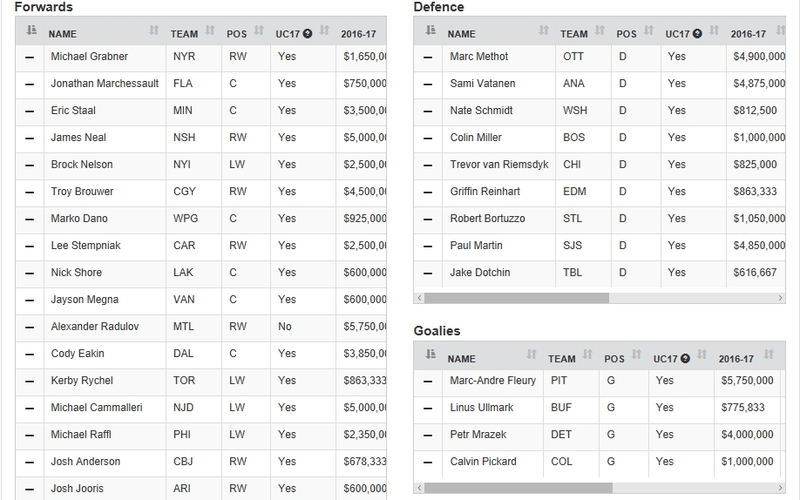 For the teams that lacked a worthy investment (I'm looking right at you, Vancouver), I picked for lowest cost + utility or upside if available. Here is the link for my roster as well. Overall, I'm very pleased with the team I drafted because it's relatively young, has some speed, has some scoring, has some depth, has quality goal-tending, and everybody whose name doesn't end in "-adulov" is under contract for 2017-2018 or beyond. Again, I realize that some of the people I took are "protected" by yet-to-be-declared deals, but given that I believe the roster above is a playoff team, I don't understand why the Golden Knights would deliberately ice an Edsel of a roster. A few teams gave me fits, because their available players either sucked, were not under contract for the 2017-2018 season, or had prohibitive contracts that detracted from other positions. For example, the New Jersey Devils are a team largely bereft of talent. Beau "I BLOCKED YOU ON TWITTER BECAUSE YOU CALLED ME FRAGILE" Bennett (true story, btw) is a Restricted Free Agent (RFA) and given Bennett's inability to take obvious criticism, I don't see any way in hell that Beau goes to arbitration, so he's a cheap play. BECAUSE BEAU BENNETT IS INJURY PRONE! There. I feel better, do you feel better? Anyway, I opted for the overpriced and getting old Mike Cammalleri because he has skill, can finish, and injects veteran leadership into a team that's literally a scrap heap of used parts. Another tough choice was taking Michael Raffl from the Flyers. Raffl is only slightly removed from posting 20+ goals and his downturn in goals & points is directly attributable to an injured-plagued 2016-2017 campaign, but Raffl offers my Golden Knights team a guy who has been there, done that. Unfortunately, his 20+ goal season came with a $2.5 million price tag, which makes him a pricey speculative grab, but given the relative dearth of quality LW's and the Flyers' overall awfulness, Raffl became the best of the worst. Selecting Paul Martin at age 36 and with a hefty cap hit nearing $5 million a year may seem like a Homer move on my part, but I selected Martin for his ability to quarterback the power-play, and given that Martin played 19+ minutes a game for the Sharks and I have him slated to play #5 or #6 minutes for the Golden Knights, he provides a solid & reliable presence on the blue line with both offensive upside and leadership for the kiddos. James Neal and his painful salary cap hit ($5 million/year) gives Las Vegas a devastating shot on the power-play and a guy who is more or less born to play in the glitz & glamor of Sin City. ...so I drafted Robert Bortuzzo (yet another former Penguin!) instead. Now, Bortuzzo may seem like even more of a Homer selection than Martin, but there's a method to my madness, namely that Bortuzzo is crazy and will drop the mitts to fight anyone ("GRIT! "), and Bortuzzo is a right-handed shot. Coincidentally, all of my pairings on defense (and my healthy scratches on the blue line) have appropriate left and right-handed shots for the respective left and right defensive positions. Special thanks to the Florida Panthers, the New York Rangers, the Ottawa Senators, and the Detroit Red Wings for making my draft selections very simple. In order: Marchessault is young, cheap, and just scored 30 goals last season (?!?! )...Michael Grabner is very, very fast and good on the PK...his missing finger tip notwithstanding, Marc Methot has #1 or #2 defenseman qualities and Ottawa is weaker without him...and finally, Petr Mrazek is 25, and probably should be Detroit's starting goalie over Jimmy Howard but Ken Holland has lost his mind. For my Vegas Golden Knights, yes, Marc-Andre Fleury will be the unquestioned #1 netminder in large part because I would immediately ship Mrazek and his $4m contract out the door to a team in need for future picks, and I would pull the same trick with either Linus Ullmark or Calvin Pickard (most likely Ullmark though). Yes, he's 30. Yes, his price tag before he hits full-blown free agency in July was $5 million a year. Yes, it's entirely possible that Radulov walks and finds a better deal elsewhere instead of signing with Las Vegas. Despite all of those concerns, a healthy and productive Radulov gives my roster the ability to roll 4 lines, each with the potential to score. What are your thoughts on my roster? What would you have done differently? Any particular player or decision strike you as odd/unexpected/CLEVER?!/confusing/STUPID?! Feel free to comment below or tweet away!